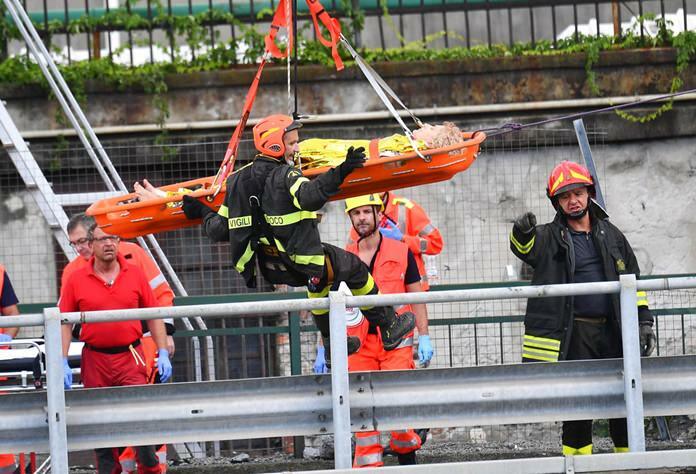 Genoa, Italy (AP) — Italian emergency experts pulled two more bodies out of tons of broken concrete and twisted steel Wednesday after a highway bridge collapsed in Genoa, raising the death toll in the disaster to at least 39 people. The collapse of the Morandi Bridge sent dozens of cars and three trucks plunging as much as 45 meters to the ground Tuesday as many Italian families were on the road ahead of Wednesday’s major summer holiday. Investigators, meanwhile, were working to determine what caused an 80-meter long stretch of highway to break off from the 45-meter high bridge in the northwestern port city. Mehdi Kashani, an associate professor in structural mechanics at the University of Southampton in the U.K., said pressure from “dynamic loads,” such as heavy traffic or wind, could have resulted in “fatigue damage” in the bridge’s parts. Italy’s minister of transportation and infrastructure, Danilo Toninelli, said there was a plan pending to spend 20 million euro on bids for significant safety work on the bridge.